The ship has to be cleared by the local airport Traffic control, as the ship will block the approach to the runway as you go along. Most larger cruise ships dock at the Port of Castries. The center of town can be reached on foot in about 15 minutes. Taxi rates are government controlled and expensive and it is advisable to agree on the fare with the driver before leaving port. A new port, located in Vieux Fort, is being constructed with a recently development international airport and host turnarounds for European cruise lines, which often use charter flights for fly-cruises during the winter Caribbean season. 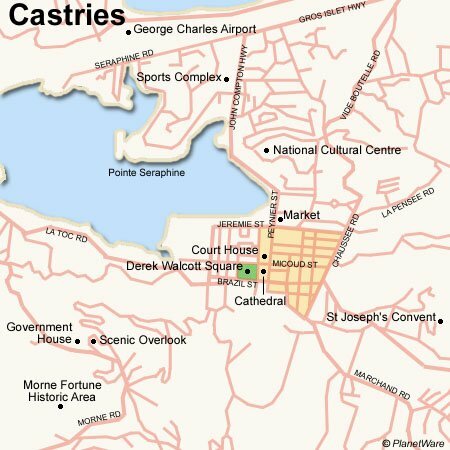 Printable map of Port Castries to take along. Map of the island. Cruise calendar for Port Castries. Cruise calendar for Pigeon Island. Cruise calendar for Rodney Bay. The capital, Castries, is attractively situated in a sheltered bay against a backdrop of mountains. The strategic importance of its excellent natural harbor was recognized from the earliest days of European settlement; for years Britain and France fought bitterly for possession of the island. At the end of the 19th-century, a boom in shipping put Castries in 14th place among the world's ports in terms of freight handled. Water taxis are a main source of income for many locals and can be a much quicker, convenient and picturesque method of traveling short distances to private beaches or coastal towns. Many water taxi operators in the Town of Soufriere can be found at the jetty. On the internet there are many operators who offer their excursions. Many operators can be found at the pier and a four hour tour of the island is approx. $150 per taxi. Roads are not easy to navigate, renting a car is not recommended. Soufrière is a town and quarter on the Southwest coast of Saint Lucia in the West Indies. Soufrière was the former capital of Saint Lucia during times of French rule. It is now a small sleepy fishing port with an emerging tourism industry. It boasts several attractions including a "drive-in" volcano, the Diamond Botanical Gardens with waterfall (briefly featured in the Superman II movie) and historic mineral baths, plus the nearby black sand beaches of Anse Chastanet to the north and Malgretout to the south. The white-sand beaches at Pigeon Island have all sorts of amenities, including a restaurant, historical museum and water sports. At Rodney Bay you can climb aboard the brig Unicorn, used in the film Pirates of the Caribbean and see the west side of the island by sea from her decks. There is a marine sanctuary (national park) on one side of the island by the Anse Chastenet resort. Great spot to learn about local marine life & ecology. Diamond Falls Botanical Gardens, a six acre multi-award winning tourism site, is an attractive, alluring and peaceful retreat from the outside world. Enjoy the beauty and sultry warmth of the tropics whilst walking through lush fertile vegetation and marvelling at the diverse range of tropical flowers and plant life. You have just stepped into a world with a breathtaking waterfall, hot mineral springs fill the historical baths with age old medicinal waters and flora and fauna abounds. Located on the the Northwest coast of St. Lucia, on the popular Reduit Beach, Splash Island is the Caribbean's first open-water sports park. Newly opened in August 2015, Splash Island is located near the multi-award-winning Bay Gardens Beach Resort & Spa located in Rodney Bay Village, Gros Islet, St. Lucia. At the port you will find a shopping complex with souvenirs, island-made handicrafts and duty-free items. The island's best-known products include hand-screened batik fabrics, pottery and straw articles. You must show your passport and cabin key card to get duty-free prices. The Castries Market and Vendor's Arcade is the largest open-air market in Castries, Saint Lucia. It is located in the middle of the capital and has over 300 regular vendors and a hundred or more local sellers on market days. A few WiFi cafes can be found downtown and near the dock. On Sunday only the open markets are in business.